You've heard the classic fairy tale Little Red Riding Hood, but Red's story could have ended much differently if she'd been wearing something a little different. There's no way any wolf, no matter how bad, would try gobbling her up if she were wearing a beautiful princess hood! Your little one can dress up in this Princess Red Riding Hood Costume, and have her own royal storybook adventure! The most important part of Red's outfit is obviously her red riding hood (otherwise she would just be a girl walking through the forest), but with so many great looking red hoods out there, it's hard to pick just one. Some girls don't want to look like a sweet kid delivering treats to her granny, though; they want to be the princess of the whole forest! In those cases, she'll need a very nice riding hood, made of gorgeous, high quality material, and the brightest red anyone has ever seen. A princess's hood and gown should flow as she journeys through the trees, and make all of the woodland critters, even the big scary looking ones, stop to marvel at how lovely she looks! That's just the kind of costume this is, so your little one will be sure to be the loveliest girl in the whole forest. 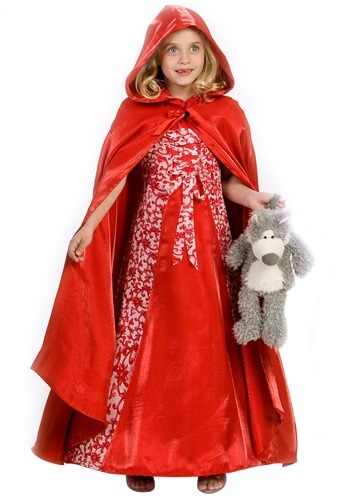 The shimmering red satin gown and the matching hooded cape are made to high quality standards befit of a princess, so she can enjoy wearing it over and over again. She'll make plenty of new furry friends in this charming red riding hood! I called the company 7 days before Halloween to get an outfit for my granddaughter. I didn't know what to expect I've never dealt with this company before. The office staff was courteous, prompt and answered all the questions I needed.I purchased this outfit and received it in a few days and was absolutely amazed by the craftsmanship especially of the sewing details in the dress it was absolutely beautiful. The red satin cape that went along with it was STUNNING!! I will order for years to come from halloweencostumes.com. The look on my granddaughters face when she opened was priceless and something that I will remember for years to come. My granddaughter is already looking for her costume for next year on the website. It's great to know that we still have a good American company working in the U. S. A. Purchased for my 2 year old. She loves it -- dances and twirls around singing about how she is a princess! "La la laaaa!" Bought it a little big for her so she can wear it for a while, maybe even next year. Great material! I was super impressed with this costume. Well worth the price.